The other night my daughter had her end of the year chorus concert. My chivalrous husband thought ahead and bought her an inexpensive bouquet of flowers from the grocery store to celebrate the event. That night we got home late, so I just dropped the entire bouquet into a vase of water and forgot about it. The next day, I knew these pretty little flowers needed some more care to ensure the longest life possible, so I took my cue from one of today's hottest trends, color blocking. Color blocking is one of the hot trends in both fashion and home interiors. But with a little know how and some simple household supplies, you can transform any boring bouquet into a trendy arrangement. Measure the height of your vase and the length of your flowers. Decide the vase to flower ratio. (For example, a 3:5 ratio -where the container equals 3, the flowers equal 5, and the entire arrangement equals 8). 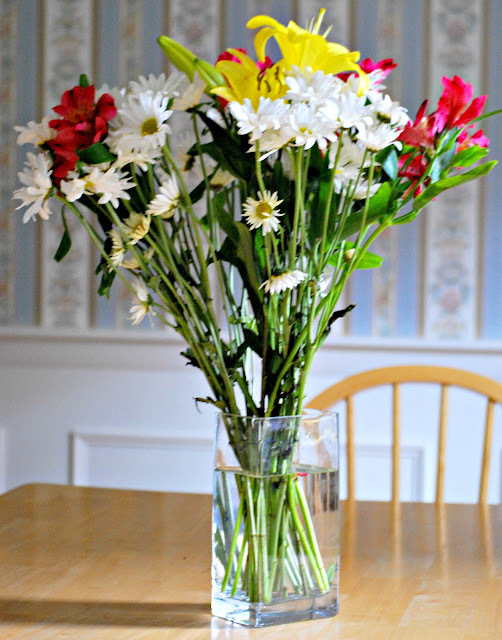 Cut your flowers' stem -this is best done under running water. Cut the stems on angle to allow for maximum life. Remove any leaves that will fall below the water line -this prevents bacteria growth. Tape off sections of your vases. (Make certain, the vase is dry. The tape won't stick to a wet surface.) For this particular arrangement, I created a simple grid. Arrange the flowers in your vase. I wanted a diagonal stripped color block, so I started with the tall yellow lilies in the back corner and worked my way to the white daisies. Actually, in the wold of floral design, color blocking is not new, as evidenced by the Biedermeier style originating in 1815 in Austria and Germany. 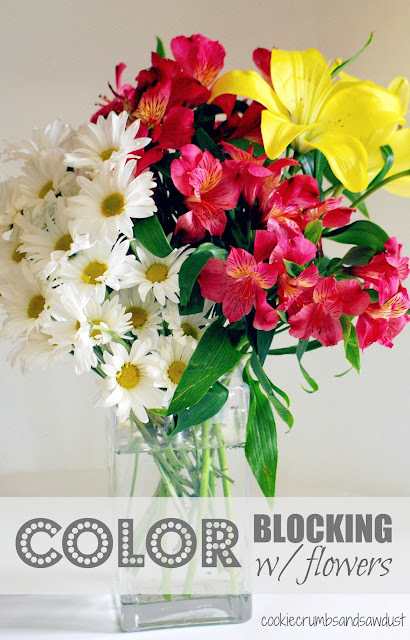 There are so many fun ways arrange flowers. What are your favorites? I love this so much. I don't care for mixed bouquets; I prefer one color of flower. But this is a great idea for mixed bouquets. Thanks for stopping by The Prudent Pantry. This is such a great idea. I'm not a fan of mixed bouquets but the color blocking made it look great! I just love the name of your blog! I love that you took an idea so hot in fashion and applied it to flowers! Creative. Great idea! I am going to keep it in mind for my next arrangement! Laura, what a difference the color blocking makes! This arrangement is beautiful and I bet your daughter loved getting flowers from her father. I'm pinning this now.